Building a truly capable, multi-station system with no artificial restrictions was one of the core ingredients added when Zetta was conceived more than a decade ago. There are many benefits for multiple stations to live inside of a single system, and one of them is the ability to share resources. With Zetta you can add a new song or commercial once and then decide, on a per station basis, whether the asset is available and playable (active) on a given station. But audio asset management is not the only area where we embraced the concept: for example, users can create any number of so-called “Banks” under Hot Keys or Stacks modules, and these Banks can be used by all stations in the system – useful for generic sound effects, newscast items etc. This works great for many sites but could also get out of hand if way too many banks exist in the system – and the number is growing every day – finding the correct Bank in a long list may become too cumbersome. In the latest Zetta version 4.2 we added a few enhancements that will drastically improve the user experience in this area. First of all, you can just click into the Bank selector and start typing; the Banks that match your text will immediately show up and you can pick the desired one either by clicking it or arrowing down on your keyboard and hitting Enter. Even on a system with hundreds or even thousands of Banks you can find the right one within no more than a couple of seconds. Secondly, we substantially improved Bank management capabilities. By default, all newly created Banks are available on all stations in the system. If the number of Banks or stations you operate is fairly low, you may be perfectly fine with the default behavior. If, however, things are getting unmanageable, we now give you powerful tools that let you assign Banks to one or multiple stations. A Bank that is not assigned to a station will not be available for the station selected in the module (yes, this is rather similar to the asset activation model mentioned above). 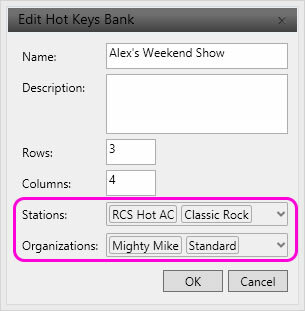 On the screenshot below, a Hot Key bank called “Alex’s Weekend Show” is assigned to two stations: RCS Hot AC and Classic Rock. In addition to this one-station-at-a-time assignment scenario you can also “mass-assign” a Bank to a group of stations in one shot, via the Organizations assignment (Mighty Mike and Standard on the screenshot). In this model, instead of explicitly specifying a station, you indirectly choose a collection of stations by selecting an Organization (which stations are members of the given organization is defined under Configuration | Organizations). Through a single Organization, you can easily assign a Bank to many stations in one shot. As shown in the example below, you can also select multiple organizations; you can even combine both Station and Organization assignments on the same Bank. button) and, all of the capabilities covered above are not limited to Hot Keys only – the same functionality is now also available for another popular module, Stacks. This is just one of the many enhancements added in Zetta Version 4.2. Please check out rcscommunity.com for a full list of enhancements in this version and do not hesitate to ask questions or submit suggestions for future enhancements.